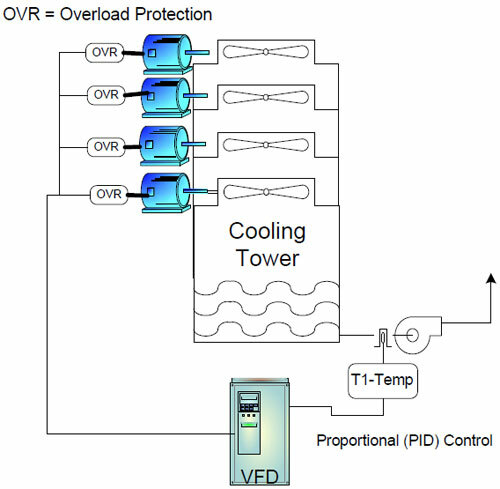 Although dampers are commonly used to control the output of fans, reducing the speed of the fan by variable frequency drive (VFD) is a much more energy efficient method of achieving the same effect. With damper control, the input power reduces as the flow rate decreases, however under variable frequency drive control the power reduction is far more dramatic. 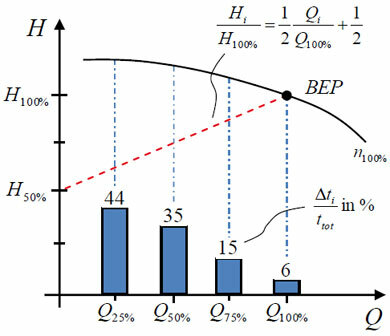 The variable torque characteristic of the fan means that the relationship between flow and the speed of the fan is such that the input power reduces in a cube law relationship with the speed reduction, as shown in the graph. Note: When operating at near full speed there is a crossover point where variable frequency drive control can use more energy than fixed speed control with dampers. 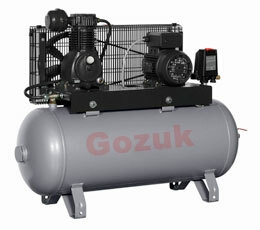 This is due to the losses in the variable frequency drive exceeding the savings from the speed reduction. Variable speed fan control can be applied in a wide variety of applications including most kinds of ventilation systems, air extract systems, industrial cooling, and combustion-air control systems for boilers. 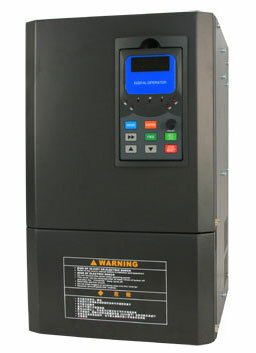 One of the limitations of variable frequency drives is that it is not normally possible to reduce the flow all the way to zero due to a reduction of cooling capacity in the motor; a minimum speed of around 30% is permissible, however this is dependent on the specification of the variable frequency drive and motor. In addition to reducing the power absorbed, variable frequency drives in fan applications may also result in reduced noise in heating and ventilation duct work due to the elimination of dampers. 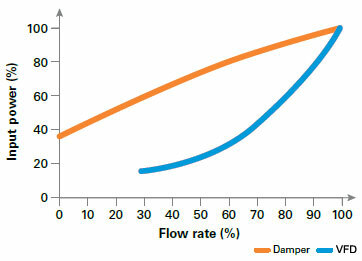 When regulating flow rates dampers can induce unwanted vortexes in the airflow which create noise and vibration. In a variable frequency drive system, making flow-rate changes generally only results in slight changes to the noise levels, which are normally undetectable to the ear. Tips: Reducing fan speed by variable frequency drive not only reduces energy consumption but may also reduce noise and vibration.